At UH Hilo we embrace our kuleana to help provide the workforce for new growth sectors in our economy. Our eyes are on the future. 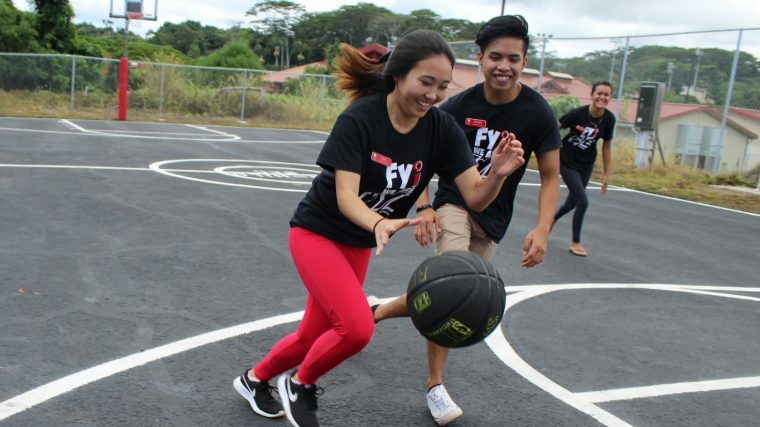 The University of Hawai‘i at Hilo mission is to challenge students to reach their highest level of academic achievement by inspiring learning, discovery, and creativity inside and outside the classroom. This prepares them for the workforce needs of our island, state, and the global community. In this column, I’d like to share with you a few of our new programs that directly answer these needs. Our new bachelor of science in aeronautical sciences program, approved earlier this year by the UH Board of Regents, has two tracks: one in commercial professional pilot training and the other in commercial aerial information technology (drones). Both are projected growth areas for the state. The pilot training track is cost effective compared to mainland programs and would support the state’s tourism-related transportation services sector. 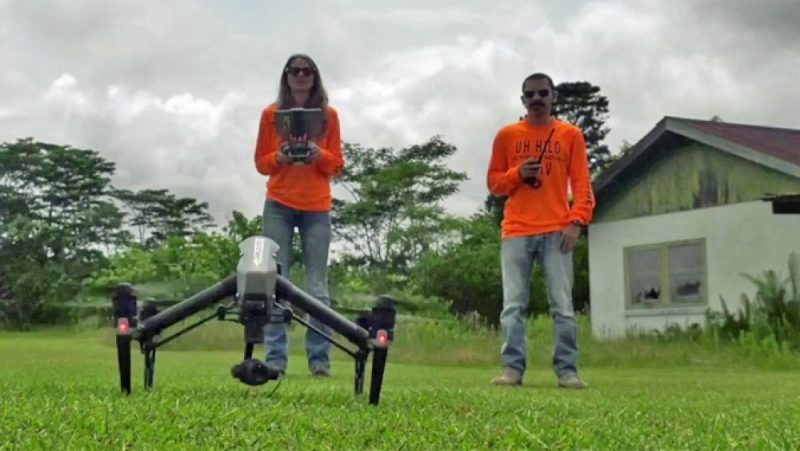 The drone track trains students for growing career opportunities in agriculture, natural disaster response, natural resource management, search and rescue, security services, and expected air transport services. UH Hilo drone team took a lead role in collecting data during the recent lava flow in Puna. Read story about new aeronautical sciences degree program. Photo via UH System News. 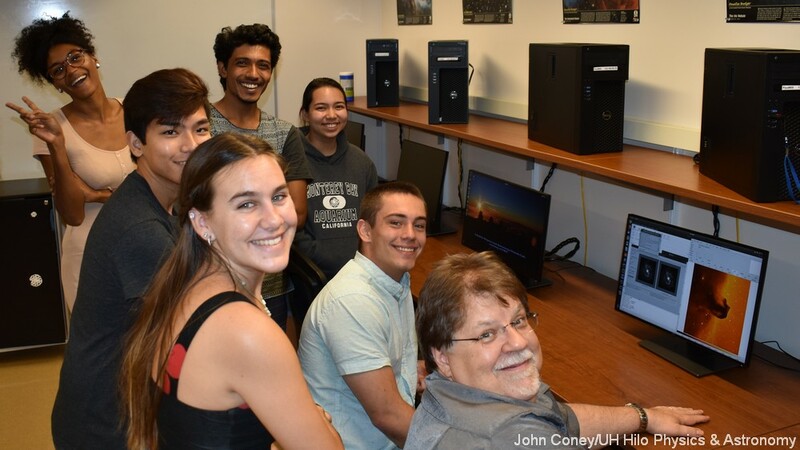 In the fast-growing field of data science, UH Hilo launched its long-planned data science program this past fall. Technology is enabling the production of data at an ever increasing rate, but there are not a lot of people trained to analyze that data, develop information, and make conclusions. Here on our island, for example, there is great need for data analytics in conservation efforts, water resource management, and climate change research. At UH Hilo’s Pacific Aquaculture and Coastal Resources Center located at Hilo Bay, hundreds of students have gained valuable hands-on experience at the nine-acre center, developing aquaponics and raising ornamental and food fish, shellfish, and algae throughout the year. Interns, volunteers, and research students have learned everything about aquaculture production from the hatchery where juvenile fish and juvenile oysters are raised to actual farming of the organisms. 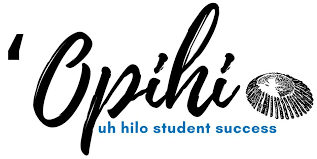 UH Hilo has the only four-year aquaculture program in the state, and the center has the only facility dedicated to aquaculture and coastal management education, research, and outreach to the community and industry. In addition to training the workforce and researchers of tomorrow, our center is helping to develop sustainable seafood production, moving the state closer to self-reliance in food while also promoting ocean conservation. 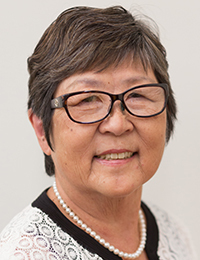 We are working with Hawai‘i Community College to develop articulated 2+2 transfer pathways to UH Hilo baccalaureate opportunities and targeting completion of pathways in administration of justice and psychology by the end of this academic year. We will extend these and look at other pathways across all the UH community colleges, in order to develop a robust transfer population. 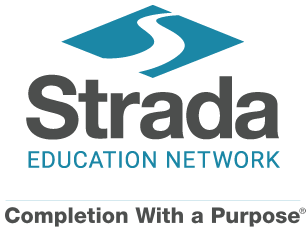 Looking ahead, we are investigating collaborative work to develop a pathway into the natural sciences and STEM teacher education programs, two fields for which there is already an important workforce need. To meet future needs for highly educated professionals in health care, we are looking toward preparing students to pursue doctoral studies. 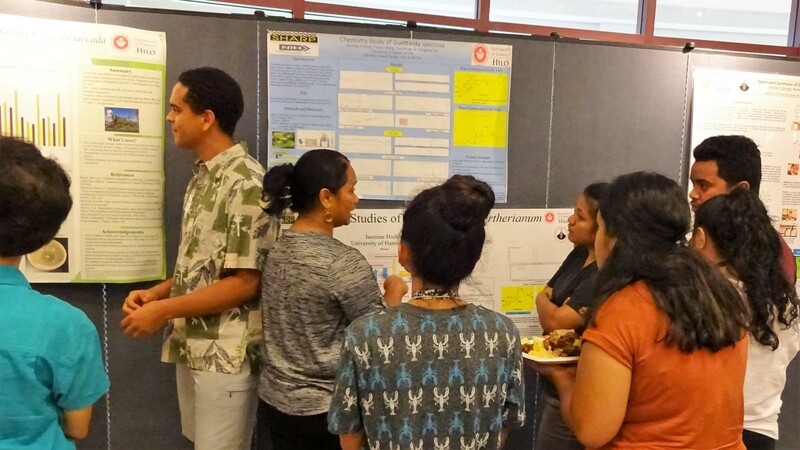 The Students of Hawaiʻi Advanced Research Program (SHARP) is a relatively new program, largely supporting under-represented students, particularly Native Hawaiians and Pacific Islanders, who would like to do research in preparation for doctoral studies. The students are mentored by expert faculty researchers to develop interest and competence in biomedical and behavioral sciences research. 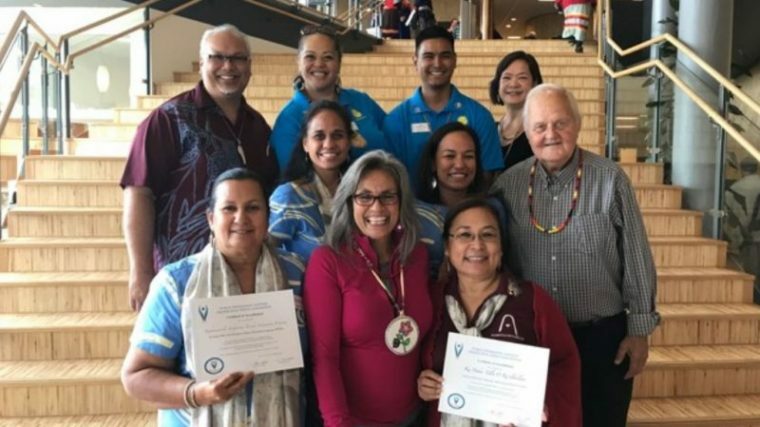 The program is funded by the National Institutes of Health (NIH) Research Initiative for Scientific Enhancement (RISE) and is administered through the UH Hilo Department of Anthropology. SHARP student Jasmine Hiking (center facing right) with a group viewing the poster presentation on her research. Read story about SHARP symposium. At UH Hilo we embrace our kuleana to help provide the workforce for new growth sectors in our economy. Our eyes are on the future. We strive to anticipate the needs of our island, state, and global community and to help prepare the professionals needed to navigate the challenges to come. Our students will not only have the chance to compete successfully in the future for well-paying jobs, but will also help raise the quality of life for their families, communities, state, and region for years to come. 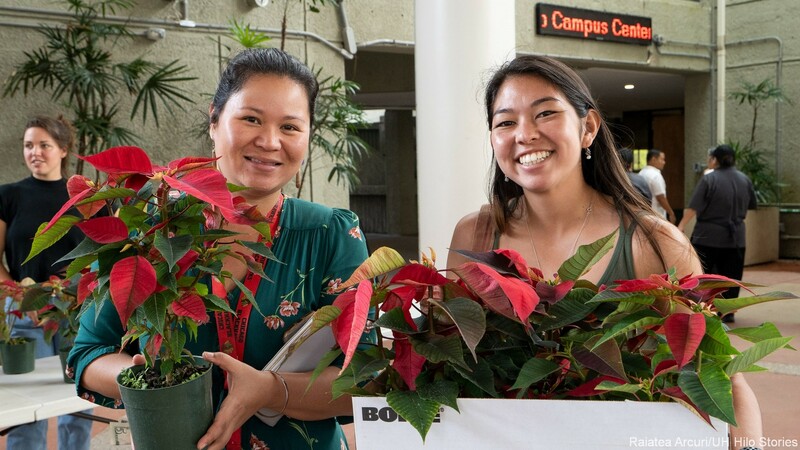 We at UH Hilo take seriously our kuleana to help provide the workforce for new growth sectors in our economy, the scientific experts to help conserve the precious environment of our island and state, and the technological resources necessary for our communities to meet unexpected crises. I look forward to the coming year as progress and growth continues at the University of Hawai‘i at Hilo. 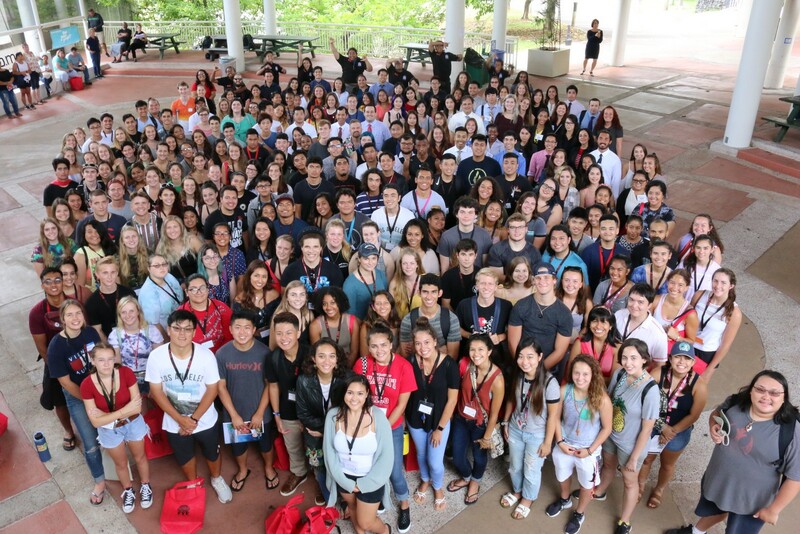 I’d like to focus this month’s column on a major goal of the university: to strengthen UH Hilo’s impact on the community, island, and state through responsive higher education, community partnerships, and knowledge and technology transfer. The new building to house the Daniel K. Inouye College of Pharmacy is well on its way to completion in July. The modern classrooms, offices, student services, and laboratories will answer the great need for state-of-the-art facilities to train the pharmacists who will serve communities in our state and region. 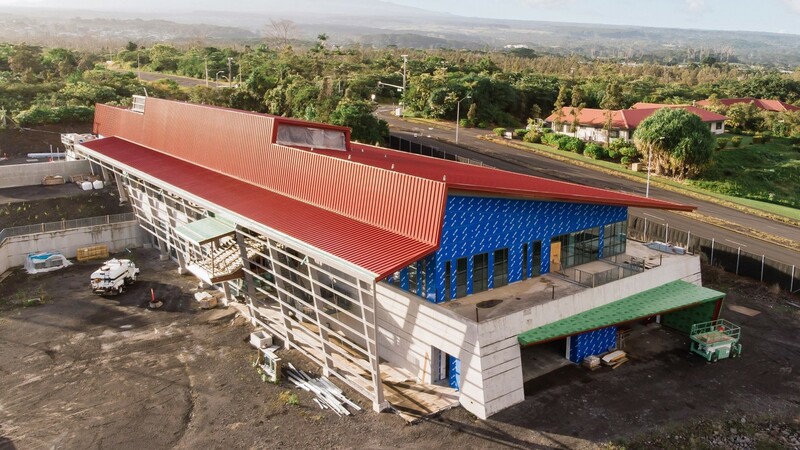 New building to house the UH Hilo Daniel K. Inouye College of Pharmacy, under construction, Dec. 11, 2018. Photo by Tracy Niimi. Last month, our new bachelor of science in aeronautical sciences program was approved by the UH Board of Regents. There are two tracks: one in commercial professional pilot training and the other in commercial aerial information technology (drones)—both are projected workforce needs in the state. The pilot training track is cost effective compared to mainland programs. The drone track trains students for growing career opportunities in agriculture, natural resource management, search and rescue, security services, and expected air transport services. 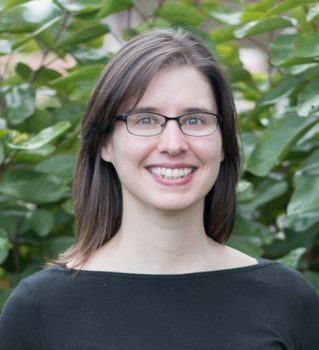 UH Hilo launched its long-planned data science program this past fall by offering a certificate in the fast-growing field. The program is filling a need in the state because almost every branch of science collects massive amounts of data, but there are not a lot of trained people able to analyze that data and make conclusions—for example, here on our island, there is a great need in conservation efforts, water resource management, and climate change research. Partnerships are key to conducting effective scientific inquiry into 21st century challenges. 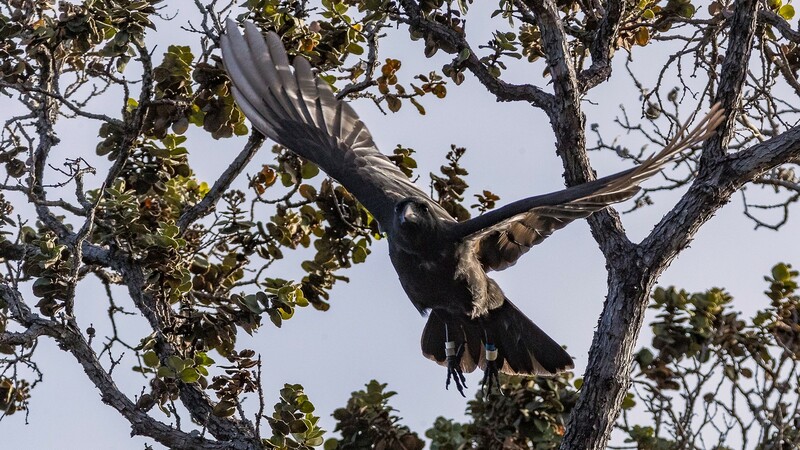 Here is an example in the field of conservation biology, specifically research to save the endangered ‘alalā (Hawaiian crow) from extinction. One of the recently released ʻalalā. Photo San Diego Zoo Global. In collaboration with a Silicon Valley company that provides sophisticated genomic analysis systems, geneticists at UH Hilo and San Diego Zoo Global have fully sequenced the genome of the endangered ‘alalā. Once reduced to a population of about 20 birds, the sequencing of the species’ genome will be important to track any genetic challenges that may occur due to the reduced genetic diversity now seen in the species. This is an extremely important contribution to conservation genetics. The genome assembly is now publicly available. Currently, the UH Hilo geneticists are collaborating with researchers from California, New Zealand, and Australia to do a genetics study addressing the hatching failure of the ‘alalā and the endangered kākāpō of New Zealand. 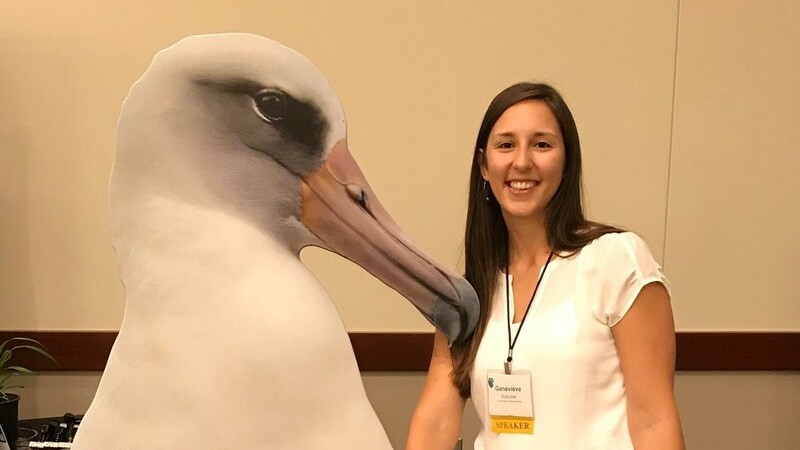 Another research team, this one from the UH Hilo Bioacoustics Lab, recently received a $50,000 award from the Disney Conservation Fund to work in collaboration with the ʻAlalā Project, a partnership between the Hawai‘i Department of Land and Natural Resources, San Diego Zoo Global, and U.S. Fish and Wildlife Service, to find out if captively reared ‘alalā are developing new vocalizations as they adapt to new situations encountered in the wild. This information will greatly assist in the conservation efforts of ʻalalā. 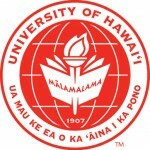 UH Hilo’s response to the recent lava flow in Puna is a good example of the university sharing its expert knowledge and technology resources for the benefit of our local communities. As the lava threatened vulnerable communities, Hawai‘i County Civil Defense reached out to UH Hilo’s experts in drone technology to do high-resolution mapping of the flow areas. Government responders needed to pinpoint exact locations of the advancing lava, and the UH Hilo drone team was able to capture overhead shots, and then quickly relay that information to Civil Defense. Another research team from UH Hilo conducted real-time chemistry analysis of lava samples that helped determine how the lava would behave and how fast it would move. The data provided critical information to the U.S. Geological Survey scientists responding to the natural disaster. The samples were collected daily from the flows, bagged and dated, and brought back to the Hilo campus for analysis. It was the first time scientists looked at the chemistry at the same time the volcano was erupting. Yet another research team provided precise leveling of the ground around the Puna power plant to detect whether the surface was rising due to the flow of magma beneath the surface. The monitoring would alert officials if the facility was about to be compromised. The longer-term scientific value of the data collected by these research teams helps government officials better understand these types of eruptions so that responders can do an even better job of predicting in the future. We at UH Hilo take seriously our kuleana to help provide the workforce for new growth sectors in our economy, the scientific experts to help conserve the precious environment of our island and state, and the technological resources necessary for our communities to meet unexpected crises. By working together with our local communities and in collaboration with myriad partners, we help improve the quality of life for everyone. Wishing you a happy and productive 2019!